Before the NWMLS data hits this week let’s check in on how Consumer Confidence and mortgage interest rates fared during October. The overall Consumer Confidence Index currently sits at 94.5, up 6 percent in a month and up 31 percent from a year ago. At 93.7, the Present Situation Index increased 1 percent between September and October, and is up 29 percent from a year earlier. The Present Situation Index is currently up 364 percent from its December 2009 low point, but still down 32 percent from its pre-bust peak in July 2007. The Expectations Index also rose in October, up 10 percent from September, and is up from a year earlier by 32 percent. As of last week, the 30-year mortgage rate was at 3.98 percent, down slightly from the 4.14% level it has been averaging between late May and early October. 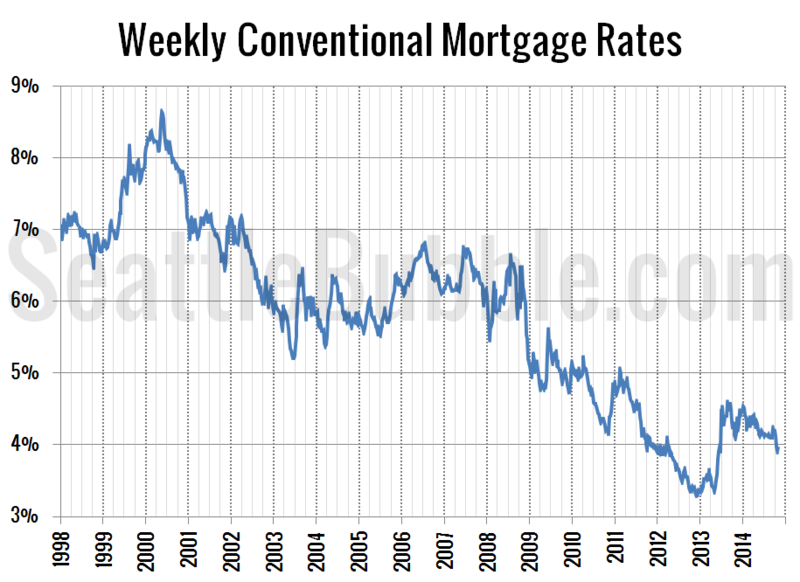 Current interest rates are roughly on par with where they were in November 2011 and nearly two and a half points below the 6.41 percent average rate during the height of the housing bubble through 2006. Graphs can be hot air allegation graphs, but tracking recent actual dollars spent is cost data. Its worsening. Actually, this is something conservatives and pessimists have pulled out of an otherwise stellar economic report for the quarter. We sure wouldn’t want Obama and the Dems to get any credit for an improving economy, would we? It is a relatively small one-month change in consumer spending and it is very much subject to revision. If the change is real, it might be something as simple as what is driving today’s election– people say they are worried about Ebola and ISIS. Kind of nutty, given the other stuff to worry about, but maybe it is enough to keep people away from the shopping mall. From my perspective this so-called bad news is good news anyway. By definition, what is not consumption is savings. If people are not spending it at the mall, they are paying down debt left over from the recession or saving a bit more. What we really need to send consumer confidence back up to 2007 levels is another widespread cash out of equity. I’m a little disappointed that 40% appreciation hasn’t opened the flood gates more than a dry dusty trickle. I though when I had that magic ‘quarter mil’ in equity lenders would be banging on my door to give me a lifestyle of unparalleled luxury. Hasn’t happened. Even my mortgage broker, who sends quarterly updates via automated post card, hasn’t even *hinted* at the possibility of cashing out my well earned ‘appreciation’. What is wrong with this country? Just a couple of years ago Mr and Mrs subprime would be offered the opportunity to cash out every last penny and then a few grand on top of that. Here I am, with equity, and nobody’s beating down my door to borrow against it? How are the doomsdayers going to get their $0.40 on the dollar buying opportunity in 2016 if people aren’t allowed to spend themselves into oblivion? I cashed out my appreciation. A bird in the bag is worth 2 in the bush. An increase in debt will temporarily put burgers on the table. But if your job salary decreases or goes away you’ll seriously regret it. RE: Mike @ 4 – Lending standards are still rather tight. If you want to talk loosey goosey, walk onto an auto lot. They will be happy to loan you all you need at subprime rates, for a ride you can’t afford. Can’t make the payment? Not to worry. They already installed an ignition interlock that will disable your car and leave it ready for the repo-man. Can’t get to work the next morning? That’s your problem now. Our nation’s poor are like pellet fuel, we just keep grinding them up, compressing them into tidy little tidbits, and then burning them for that cozy warm flame. Gas prices are based on supply and demand. That means the lower gas prices are the result of: (1) Increased supply; and/or (2) Lower demand (national and international). To the extent that the lower gas prices are due to #2, that is not good economic news. saddens me to see how we treat the less fortunate members of society. Taxes hit them by far the hardest and our policy of “go get a job you lazy bum” completely ignores the direction our economy has taken over the last 30 years. I have to wonder exactly which consumers are feeling confident? What is see is winner take all and a pipe dream sold to the losers. Stagnant Total Labor Market in Seattle Bellevue Tacoma has mostly been around 1.9 million workers since the 2008 Great Recession. It did uptick about 50,000 end during the 2013 4th QTR and the 2014 1st QTR….but suddenly lost about 25,000 by the 3rd QTR this year….lower gas prices? How does the Seattle job market compare to the whole state of Kansas [we all assume its worse there, wrong]. The Kansas U3 unemployment is 4.8 versus our 5.1. The Total Labor Market for the whole state is about 1.5 million averaged since the Great Recession, albeit it shed 30,000 jobs since 2008, it gained 20,000 of ’em back this year….more jobs going to Kansas City soon too, the Big Three is building a new assembly plant there soon…versus our future, 30% of Boeing’s defense leaving Seattle. No wonder there’s no traffic on Kansas City Freeways [empty and 70 mph during rush hour]….we have more people working and crammed on like 5% of the land space than the whole State of Kansas…..LOL, i.e., cheap real estate. I read recently Millenials are flocking there. With all the youth down there, my daughter has 10 times the friends there than she had here BTW. Amazon wants to cram 4 workers into a 1 BDRM apartment for $2200/mo and no car parking by Lake Union, no good grocery stores either. Subway? Slave labor in their warehouse too, I read recently. RE: wreckingbull @ 7 – Yea, I don’t know where Mike is getting his news. HELOCs are coming back and are at the highest level they’ve been since 2008. People are just as desperate to use their homes as ATMs as ever. You also brought up subprime car loans. People love their credit. Apparently we learned nothing last time. 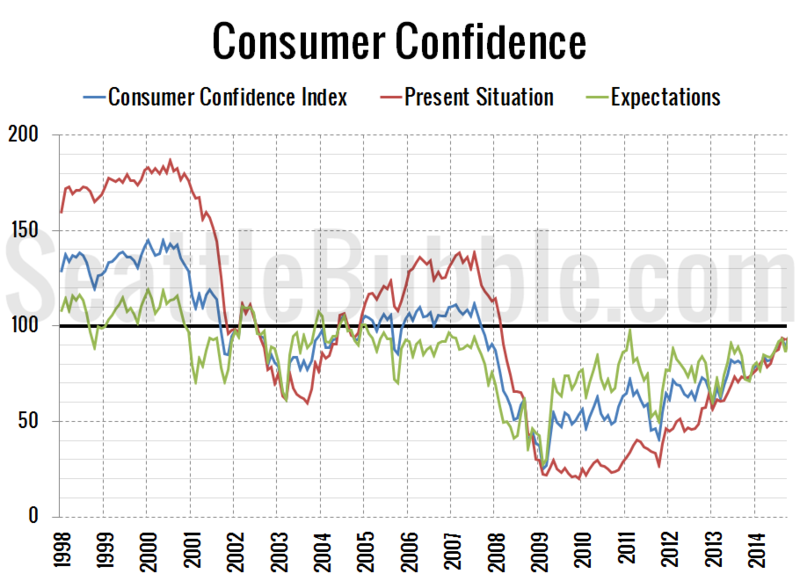 So just how indicative is the consumer confidence level of anything? It just means that consumers are confident. Weren’t they confident in 2007 and 2008 before the real estate market and stock market respectively crashed? Wasn’t the consumer confidence level high in 1929? I’m not suggesting that if the consumer confidence level is high, we’re about to have a crash. But I’m not seeing that it’s predictive of anything. Am I wrong? RE: Ira Sacharoff @ 12 – It is pretty useless, IMHO. It didn’t even predict the outcome of the elections in 2012. Maybe it’s supposed to be a contraindication? RE: Ira Sacharoff @ 12 – I think consumer confidence is a very short-term predictor of consumer spending (particularly via credit card) and not much else.